Everybody says that the Raged Barbarian is absolutely OP (OverPowered). I mean - it's all we hear about on the forum (well...along with how the game is unfair because players are matched by skill rather than their BH level). Like I said - really, he's dirt cheap and fast to get upgraded. For F2P players and anyone else looking for an offensive powerhouse, the Raged Barbarian is definitely the way to go. 20 per camp, so up to 100 Raged Barbarians in a single attack! It may not always produce a 2-star, but it sure is a fun attack. My next couple of articles are strategy based. I want to talk about what I call the Four Pillars of Clash - Offensive Capabilities, Attacking Skills, Defensive Capabilities, and Base Design. For this first article, we'll focus on the first two pillars which comprise offense. Do you ever wonder why you are where you are in the game? Offense is the key to a Player vs Player (PvP) game.Defense is important, don’t get me wrong, but you can have the best defenses in the game yet keep on losing because your offense is unable to get you over the goal line. Offensive play can be broken down into our first two pillars - your Offensive Capabilities and your Attacking Skills. Offensive Capabilities are just that - what your offense is capable of delivering.Each level of Builder Hall has certain troops and specific levels of those troops that dictate how powerful the offense can become. So...some say that the Night Witch is dead at BH7. I hear it on the forums all the time - players complaining that one troop or another is OP (over-powered) and attacks with the Night Witch are not the answer. I couldn’t disagree more. I think the the Night Witch is just now really coming into her greatest use. I can hardly wait to see her at BH8. As I look through my Battle Logs for my BH6 and BH7 games, on any given day I will see 3 or 4 out of 10 attacks had the Night Witch in the attack. Most are Mitch, GiWitch, and there’s even the occasional Mass Night Witch. I suspect we’ll start seeing Drop Mitch here soon, and Baby Mitch pops up periodically. Some players are testing new hybrid army comps - I had one last night that used Boxer Giants, Night Witches, and Beta Minions. If there's one troop that has lit the Builder Base up, it would be the Raged Barbarian. He's the first troop we get, but he's also the least expensive to upgrade. At BH5, he becomes effective at taking down a lot of bases, most importantly the diamond base design that had us vexed. He just needs a little help from his buddy the Bomber. Bomber + Raged Barbarians = Bombarian. Anyone who knows me will say it fast - I am an airbender. 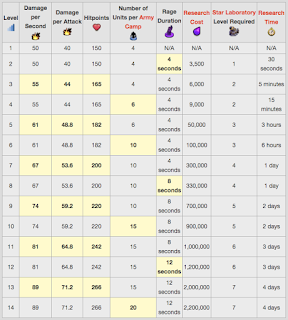 My favorite attack strategies are air based, and I move fully air-based attack runs starting mid-way through BH4. Learning a full ground attack is a bit tough for someone who isn't used to dealing with walls. We were talking over on the “When Air Attacks!” thread at the oh-fishy-all forums and Saukin94 asked what I thought about Minion Drops with a Night Witch thrown in for good measure. 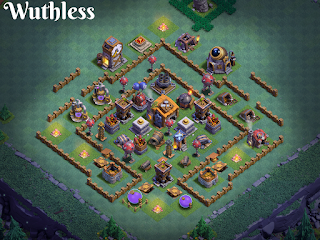 Other players will occasionally ask me to give a new attack strategy or base design a spin. I have several games I play, running from 2700 to nearly 5000 trophies, so I can usually try things out in several scenarios. It keeps things interesting. And, of course, everyone knows how much I love the Night Witch; she’s one of my favorite troops. I cracked out my main, hovering around 4800 trophies after the previous day’s losing streak (300 trophies lost...ouch!) and started my attack run. I went with 2 camps each of Beta Minions and Drop Ships, 1 camp of Night Witches. "Rush to BH7; there's no penalty to rushing on the BB." Of course, this is only half the advice you need. Rushing on the main game and the BB are roughly the same in principle design - there's a pace that's so fast it outstrips your ability to compete, and a pace so slow that you might as well be maxing. There's also a wide strip between that hosts the "fits just right" for you as an individual. 1) Attack often - Your skills as a raider will determine just how successful you are as a rusher and how much you enjoy the game. If you can't attack and are constantly losing, that's not going to be very much fun, is it? Phoenix Abyss is now a BH7! The game was largely level 4 for defenses - still had the level 1 Roaster, level 2 MultiMortar, and level 3 Crushers - and I had just recently finished off Beta Minions to level 12. So, the timing was right and I pulled the trigger on the upgrade. Of course...first I had to upgrade the storages, then I had to get the gold.... All that said - it finished the upgrade this morning. This game has been all F2P from the beginning, but I had to take one for the team here and buy the BH7 Bonus Pack. Sorry to those of you who are diehard F2P - the Bonus Pack is simply too good a deal to pass on. 20 bucks gets you the level 4 Giant Cannon, 2M each of Gold and Elixir, 2500 gems.... Between all that, buying the fifth Army Camp and just upgrading the FireCrackers and Hidden Tesla to level 4 (gemming the timer), it saves better than 3 weeks of work. I took another look at my favorite, BH6 attack strategy today - Mitch. Mitch at BH6 includes two camps of Beta Minions, two camps of Night Witches. You launch your Battle Machine from the corner and activate his ability. At about the same time, you use a few Beta Minions to snipe anything that is outside the reach of defenses. Once the Battle Machine reaches the base (or is close to it) you drop your Night Witches. As they approach the base, you drop the bulk of your Beta Minions behind them and watch the madness unfurl. This same attack works just as well at BH7. Given the fifth camp, I typically add another bunch of Beta Minions. This adds just enough steam at the end to push trough a bit further. CoC BB - Mass Beta Minions at BH7, plus 4 more base designs! My Psyberon game finished its upgrade today. I grabbed the BH7 Bonus Pack, used the gems and additional elixir/gold to drop the fifth Army Camp; upgrade the four new walls, Hidden Tesla, and FireCrackers all to level 4; then set about adding in some new bases to work through as I raided. The game started off at 3162 trophies and I proceeded to win 11 out of 12 matches. Some opponents were BH6, others early BH7 similar to my own game. All went down well using Mass Beta Minions (MBM). MBM is a solid attack strategy I start using at BH4 on my games, especially my rushed games. One of the basics of rushing on the Builder's Base is that you need to have at least one attack completely maxed before moving up to the next BH level. Being an air guy, Beta Minions are my key troop of choice.